The type and quality of representation Mr. Kim provides are what makes his firm stand out. He consciously strives to be the “Patch Adams” Personal Injury Attorney of California. This requires an understanding that clients are not merely case files, but are husbands or wives, parents or siblings or children with real problems who need real solutions. Achieving such results begins with truly having compassion and patience with clients and a genuine belief that this type of work is much like a public service. 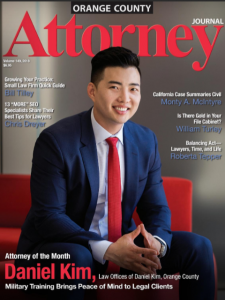 Mr. Kim’s early-aged philosophy in public service materialized when he enlisted in the U.S. Army as a paralegal in the Judge Advocate General’s (JAG) Corps. He was stationed all over the world to include Seoul, South Korea, and Baghdad, Iraq. As a JAG member, Mr. Kim worked in one of the largest military jurisdictions and learned to adapt and work efficiently and cohesively within fast-paced, highly stressful environments. During his military career, he was awarded numerous awards to include a distinguished award that recognized him as the top enlisted JAG member in all of Asia Pacific. Chapman University Dale E. Fowler School of Law, J.D.